Recipe for small cakes with cheesecake and fruits. The perfect summer recipe is our quark cakes with fruits from freshly picked apricots, to peaches or any other pome fruit. This recipe goes very well together with cherries and sour cherries. As cherries are available throughout the year in practical jars, your can make these little cakes in warm spring, golden fall or even in winter. Heat oven and mix all ingredients. Preheat the oven to 175 degree. The great thing about this recipe: leave fruits aside and mix all the ingredients together. 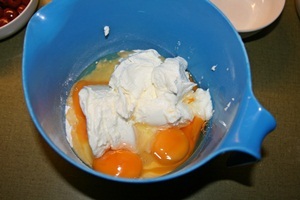 It is so easy to mix you just have to use a kitchen spoon. If you use apricots or peaches: cut them in small dices or slices and add it to the batter. 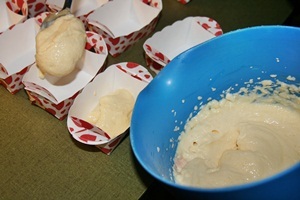 Fill the batter evenly into all 8 baking cases and put them in the oven. Leave in the oven for 25 minutes. 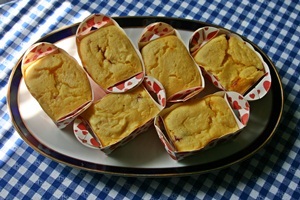 After baking the cheese cakes, turn down the eat, leave the cakes in the oven and open the oven door. If you bake your cheesecakes with cherries or canned food we would recommend not adding the fruit right away. 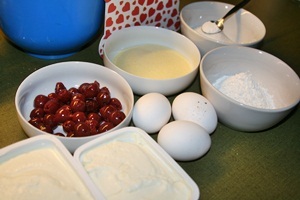 Put one spoon full of batter into the cases, then add the cherries, add another 1.5 spoons of batter into the cases. Don't fill the cases up to the rim, just fill them up to two thirds – the batter will rise during baking and you don't want it to spill over. Typical for cheesecake is, that after baking it will slightly sink. 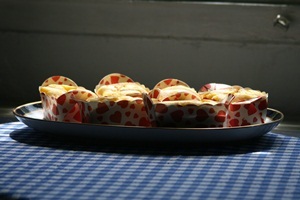 When using the slow cooling down process we could prevent the cakes from slumping down too much. By the way - this is the perfect recipe to take along when baking at your friend's house, or in your bungalow or holiday flat. The paper baking cases Lina are perfectly transportable, as their size and weight is this of envelopes. 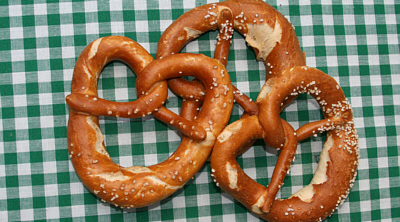 The ingredients are available in all middle European countries, so if your are planing a holiday in Austria with self supply, this would be one of the recipes to take along. A great way to eat cheesecake and use local fruits.